Welcome by today, everyone! It's always nice to have you visit me, and I hope you like what you see today as I share some Really Reasonable Ribbon projects with you. As its name might suggest, this wonderful shop is filled with a very LARGE variety of ribbons, laces, and trims of all sorts....but that's not where it ends. Really Reasonable Ribbon carries SO much more, including Mulberry Flowers, Embellishments, and SO much more. 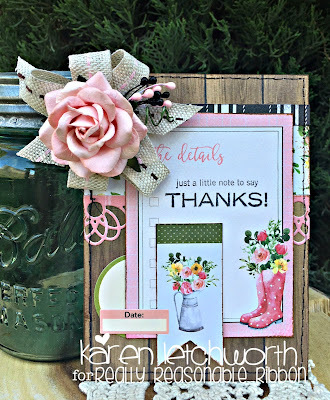 So, for today's post, I'm sharing two sweet cards, and each one showcases just a few of my favorite products from Really Reasonable Ribbon. 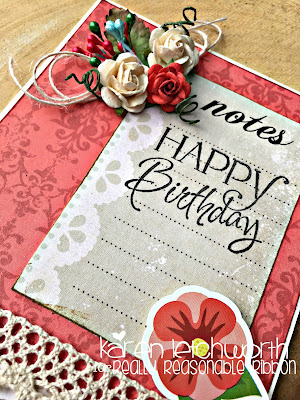 This first card was created with an ivory cardstock base and a piece of Carta Bella patterned paper. I used a second piece of patterned paper to punch a border, and just above it, I added a piece of the beautiful Juliet Natural Crochet Lace. I added a journalling card and stamped my sentiment on that. 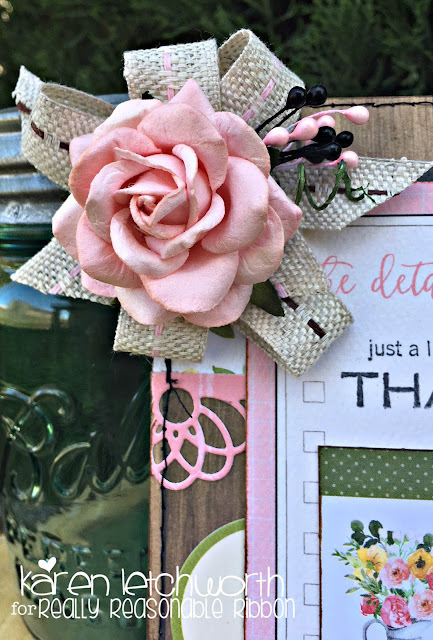 There's a flower sticker at the bottom right of my sentiment card; and at the top left, a beautiful floral treatment that includes a piece of bundled Ivory Burlap String, a 30mm Wild Orchid Crafts Mulberry Leaf, one Coral Open End Rose, and two Ivory Open End Roses. I also added some Double Head Stamens including a few green, a few Baby Blue Double Head Stamens, and a few Red Double Head Stamens. These sweet little accents, Wild Orchid Crafts Double Head Stamens are SO amazing; and at just $1.99 for a bundle of 160 pieces, they're a great bargain item that will add quite a lot of impact to your floral accents (as you can see). My second card is another fairly simple card. I used several patterned papers that I attached together with strips of Scor-Tape. I also added some stickers and did some machine stitching in black. While the card was nice.....it was missing something. Ribbons! I made a bow using a piece of Pink Center Stitch Burlap Ribbon and a piece of Brown Center Stitch Burlap Ribbon. I also added some Baby Pink Double Head Stamens and Black Double Head Stamens, and topped the bow with a Pink Trellis Rose. What I especially love about the Burlap Center Stitch Ribbons are their AMAZING texture. They, like ALL of the trims at Really Reasonable Ribbon, add so much warmth and depth to your cards and projects. 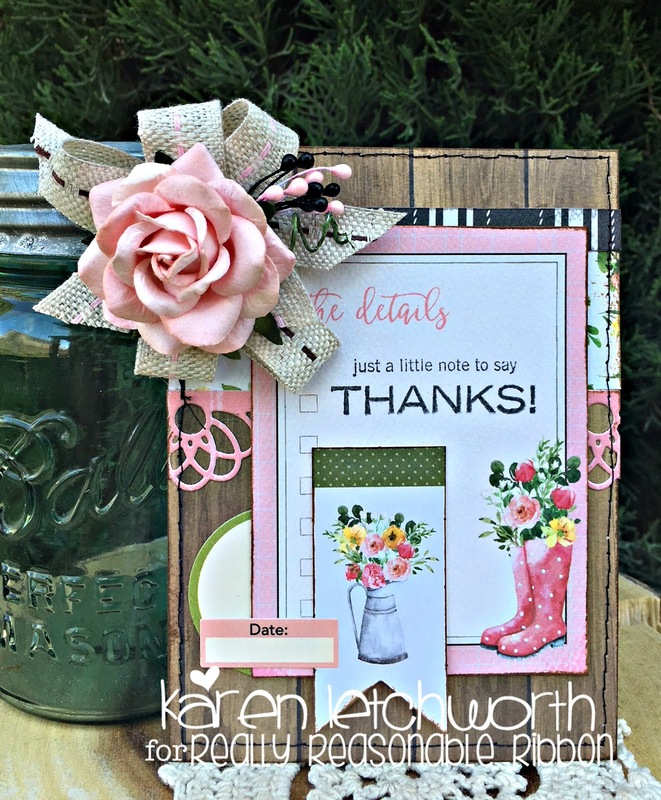 Everything you need to make your "Simple Cards" look "Simply Lovely" can be found at Really Reasonable Ribbon! Thanks again for stopping by today. Scrapy Land Challenge - #90 Anything Goes - I used a Frantic Stamper Edger Border die set on the bottom of my first card to create the border just below the lace. Karen, your cards are gorgeous. Love your flowers. Such pretty cards Karen. Love the mulberry flowers on the first one... lovely lace! The burlap ribbon looks really nice with the pretty flower on the second. Both cards are really pretty, Karen. I love the ribbons you used. Both card are so pretty. I love the flowers and late. So many awesome elements and the colors are so pretty. These are just gorgeous, Karen! 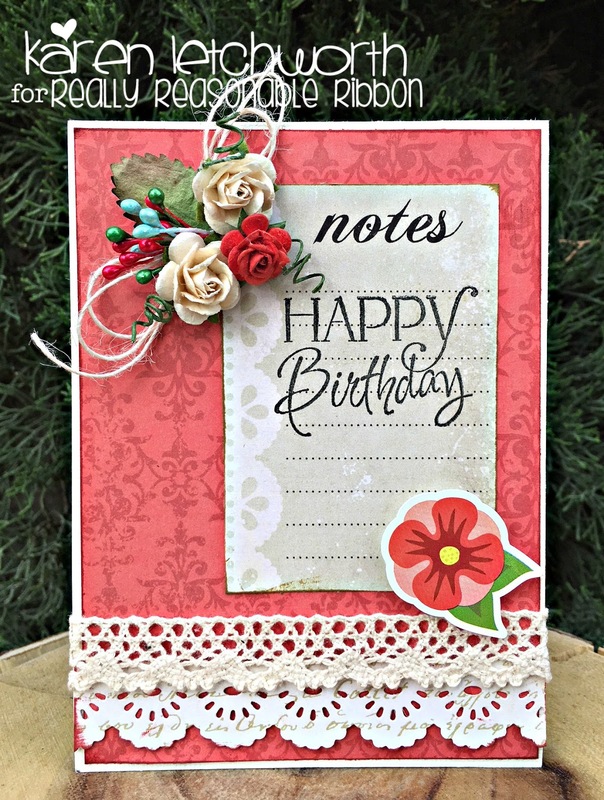 I'm especially drawn to the first one with the gorgeous bg paper & rows of lace! You are showing two very pretty and romantic cards. I like them both very much. thank you so much for your lovely comment on my blog! I will have a look!! 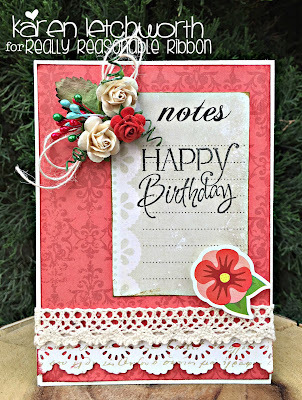 Lace and flowers - always beautiful on cards - you are the queen of flowers! Lovely work!